For reliability, for durability, for functional quality and design integrity, Heat Seal Table-Top Food Wrappers give you maximum value in any packaging operation. Heat Seal Table Model Wrappers earn daily the reputation that has made them the favorite in supermarkets, deli’s, print shops, or wherever a quality packager is needed. These units feature tough aluminum and stainless steel construction with all stainless wrapping surface for quick, easy clean-up. Each wrapper is equipped with extra large rubber feet to prevent sliding on any counter surface. And all feature the solid state controlled hot rod cutoff bar and standard 6” x 15” hot plate with a non-stick Teflon cover. Every Heat Seal Wrapper is UL listed and USDA approved. Heat Seal Table Model Wrappers are available in 1, 2, or 3 roll units. You may also select the film roll mounting system which best suits your individual needs: Axle mounting for more efficient film usage, or Roller mounting for faster, easier roll loading. It’s Portable! All Heat Seal Table Model Wrappers are easy to move--and that’s important when limited counter space means your wrapping area must sometimes be used for other purposes. Looking For A Maxi Wrapper With Mini Size? Look into the Heat Seal 625-A Mini table model wrapper. This 15” wide x 21” long unit is a smaller version of our most popular wrapper--with all the top quality features of its big brother, including aluminum and stainless steel construction, axle roll-mounting, hot rod cutoff, and Teflon covered 6” x 9” hot plate. The 625-A Mini is ideal for wrapping small packages such as sandwiches and cheese. Looking for a Food Wrapper that is Extra Wide? The Heat Seal Model Model 600A now comes in 3 extra wide models--24", 30" and 36" wide tables. 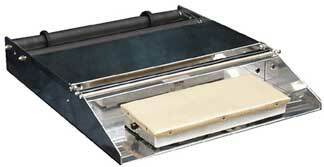 The 24" wide model 600A24 comes with an 8" x 15" hot plate. The 30" wide model 600A30 and the 36" wide model 600A36 both come with a 10" x 30" hot plate. These extra wide 600A models feature extra wide rollers to accommodate larger rolls of film. 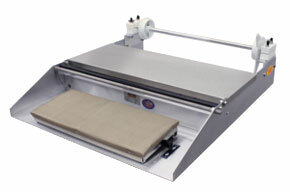 Heat Seal Model 600-A Table-Top Food Wrapper with 1-roll capacity on rollers and 6" x 15" hot plate. Heat Seal Model 625-A Table-Top Food Wrapper with 1-roll capacity on mounting axle and 6" x 15" hot plate. To Order, enter the quantity needed beside each item, then click the "Add to Cart" button at the top or bottom of the page. 1824011 Heated Cut-Off Rod - 23"
Units usually ship in 5-10 working days, FOB: Cleveland, Ohio.